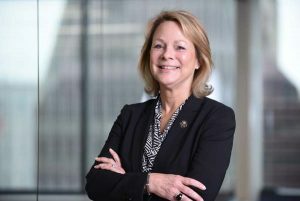 Becoming president of the Anne Arundel County Bar Association in 1995 and taking the reins as president of the Maryland State Bar Association in 2017 were two of the most important moments in Sara H. Arthur’s legal career. Arthur, a Baltimore native who graduated from the University of Maryland, College Park’s Francis King Carey School of Law, did not know anyone when she began her law career in the Annapolis area. Joining the bar associations provided her the opportunity to acquaint herself with other attorneys not as competitors or adversaries, but as eventual friends and colleagues. “Involvement in both associations also gave me the opportunity to give back to the profession that has given me so much,” she says. Arthur has worked for decades representing condominium and homeowner associations, developers, individual property owners and businesses. She works on issues related to contract disputes, including construction defects and collections. The latter specialty was useful when she established the Arthur Law Group LLC in Annapolis in 2007 in light of the impending recession and problems collecting on late bills. Arthur also handles complaints to the Maryland Office of the Attorney General and the Maryland Commission on Civil Rights. Arthur has vowed as MSBA president to enhance professional networking opportunities for its members through nurturing relationships with the state’s local and specialty bar associations, as well as other organizations related to the legal profession.